Apple’s profits fell for a second consecutive quarter, even as the company enjoyed record iPhone sales for the April-to-June time period. For its fiscal third quarter ended June 29, Apple reported sales of $35.3 billion, with net profit at $6.9 billion. That translated to earnings of $7.47 per diluted share. Apple’s revenue marked a record for the June quarter, ticking up 1 percent from the $35 billion Apple posted in last year’s third quarter. Still, profits fell 22 percent year-over-year, down from $8.88 billion in 2012. Apple also reported a drop in profit during its fiscal second quarter of 2013. Apple’s performance for the third quarter topped analyst expectations. Analysts were looking for the company to earn $7.32 a share on $35 billion in revenue. With a tiny increase in revenue but a drop in profit, you’d rightly conclude that Apple’s gross margin dropped: For the quarter, it was 36.9 percent, versus 42.8 percent on the year-ago quarter. That’s because Apple’s most popular products now have lower margins than the top-sellers a year ago. Apple says international sales accounted for 57 percent of its revenue for the quarter. The company also says it has issued $18.8 billion in cash to shareholders through dividends and buybacks. Apple says it sold 32.2 million iPhones—a record for the June quarter. 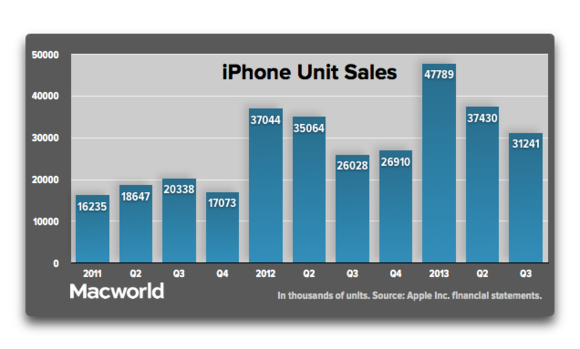 That’s up from 26 million iPhones in the year-ago period. For the U.S., iPhone sales rose 51 percent year-over-year, Apple says. “iPhone 5 remains by far the most popular [phone], but we’re also very happy with sales of iPhone 4 and 4S,” chief financial officer Peter Oppenheimer told analysts during a Tuesday conference call. Those older phones, of course, are lower-margin devices, since Apple charges customers $200 or $100 less for those phones, respectively, compared to the iPhone 5. Oppenheimer said that iPhone sales remain ahead of expectations, and that Apple is particularly pleased with the iPhone’s strong year-over-year growth in both developed and emerging markets. Apple says that ComScore shows the iPhone holds the top spot in the U.S. market for the three month period ending in May, with a 39 percent share. And the iPhone is the top-selling smartphone in Japan, and the top or second-best selling smartphone in most markets IDC tracks. With government, business, and education, iPhone holds a 62.5 percent share of the U.S. commercial market. The picture was less rosy for iPad sales, but Apple has a perfectly reasonable explanation for the 14 percent drop in tablet sales from last year’s third quarter. A year ago, Apple introduced the third-generation iPad and enjoyed a full quarter’s worth of sales to the tune of 17 million units. 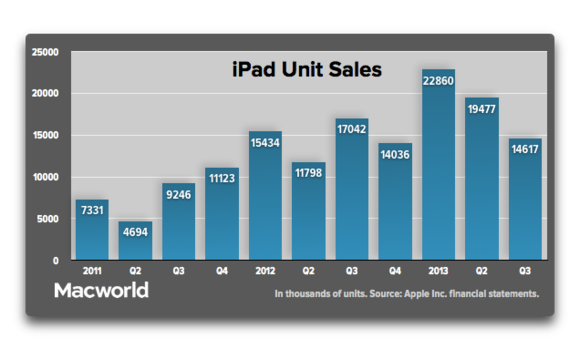 This quarter, sales fell to 14.6 million iPads. Still, Apple has plenty of reason to remain bullish on the iPad. Oppenheimer said that the iPad ranked tops in a 2013 U.S. tablet satisfaction survey by JD Power and Associates. And during the quarter, the company inked a deal with the Los Angeles Unified School District, the second largest district in the U.S., to roll out iPads to 640,000 students. In fact, the iPad got the bulk of the credit for a strong quarter of sales to U.S. schools. According to Oppenheimer, the last three months generated the highest quarterly revenue ever for Apple’s U.S. education institution business. 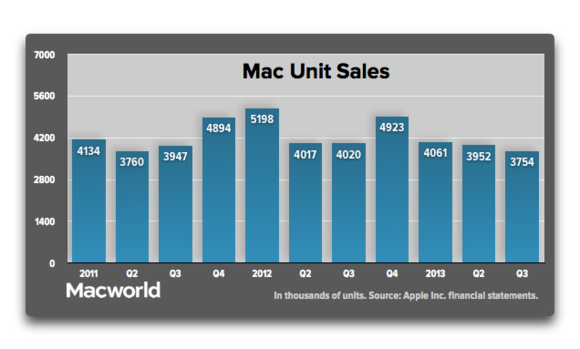 Mac sales also fell in the quarter, down 7 percent from last year to 3.8 million units. Still, Oppenheimer pointed out that the 3.8 million Macs sold beat Apple’s own expectations. And Apple’s sales still were ahead of the total PC market, which saw sales contract by 11 percent according to estimates from research firm IDC (which is owned by the same company that owns Macworld). By Apple’s math, the Mac gained market share during the quarter. The Mac was one of the few product lines to see any changes during the quarter, with Apple updating its MacBook Air lineup at the beginning of June by adding new Intel processors. Company executives had little to say about any impact those new laptops had on overall Mac sales, but Oppenheimer did call it the most successful MacBook Air launch to date, adding that customer response was great. But during the call, executives implied that there were better things to come. Oppenheimer noted that June’s Worldwide Developers Conference included previews of both the Mac Pro and the next version of OS X, code-named Mavericks. The iTunes Stores—which includes the App Store, Mac App Store, iBookstore, and the music, movies, and TV sections of iTunes—generated $4.3 billion in billings, Oppenheimer said, culminating in the best week and best month ever for App Store. That translated to quarterly revenue of $2.4 billion, up 29 percent year over year. 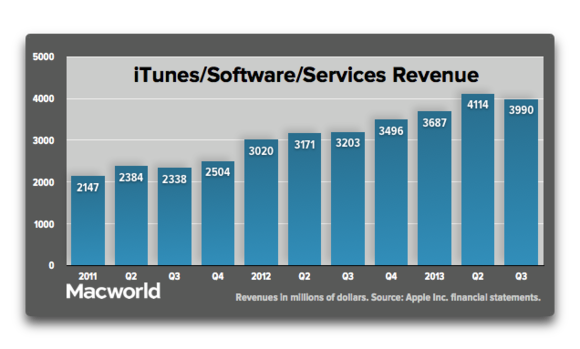 Total quarterly revenue from iTunes, software, and services generated $4 billion in revenue. Oppenheimer said that Apple now has over 320 million iCloud accounts, and 240 million Game Center accounts. 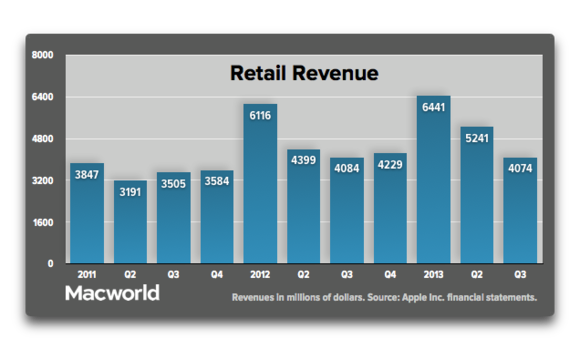 As for brick-and-mortar retail efforts, the Apple Store saw revenue of $4.1 billion for the quarter, virtually unchanged from the year-ago quarter. Oppenheimer reported that Apple saw 16,000 visitors per store each week. For the quarter, Apple had an average of 405 stores, with average revenue per store at $10.1 million—down $1 million from the year-ago quarter. Apple opened six stores across five countries during the quarter, giving it 408 stores around the globe; 156 of those outlets are outside the U.S. The company plans to open nine new stores during the September quarter, giving it 27 new openings during the 2013 fiscal year. It’s not just about new stores, however: Apple says that it relocated four of its stores to more appealing spots; it will complete 23 such relocations before the end 2013 fiscal year in September. China has been a particularly critical part of Apple's business in recent years, but that took a hit in the third quarter. “China was weaker” in this quarter, Cook acknowledged, but maybe not as weak as it might seem at first blush, he argued. “Our sell-through in China was only down four percent from the year-ago quarter, when you normalize for channel inventory,” he said. Hong Kong drop was worse, though mainland China was up five percent year over year, “but that’s a lower growth rate than we have been seeing,” Cook added. “I attribute that to many things, including [the fact that] the economy there clearly doesn’t help us there or others,” Cook said. Apple’s not done returning cash to investors. The company’s Board of Directors has announced another cash dividend, this one at $3.05 per share of common stock, payable on August 15 to any shareholder as of August 12. For the next quarter, Apple is predicting revenue between $34 billion and $37 billion, with gross margins between 36 and 37 percent. That sales figure would put Apple’s performance in line with the $36 billion in revenue it reported in the fourth quarter of 2012. For the coming quarter, Apple also predicts operating expenses will be between $3.9 billion and $3.95 billion, with a tax rate of 26.5 percent. That may dissatisfy some sections of Wall Street, where the focus is on growth and new products, but Apple’s Cook told analysts on Tuesday that he doesn’t think the company’s goals diverge from investors’ focus on profits. Updated at 2:16 p.m. PT with new information throughout. Updated at 2:30 p.m. PT with more detail in the Mac, iPad, and iPhone sections. Updated at 2:35 p.m. PT with retail details. Updated at 3:09 p.m. PT with more information from Apple’s call with analysts. Updated at 3:17 p.m. PT with information on Apple’s business in China. Updated at 6:10 p.m. with a video report from IDG News Service.